As mentioned in my last post, I was commissioned with a party dress for Niece #2. Something dry-cleanable only. 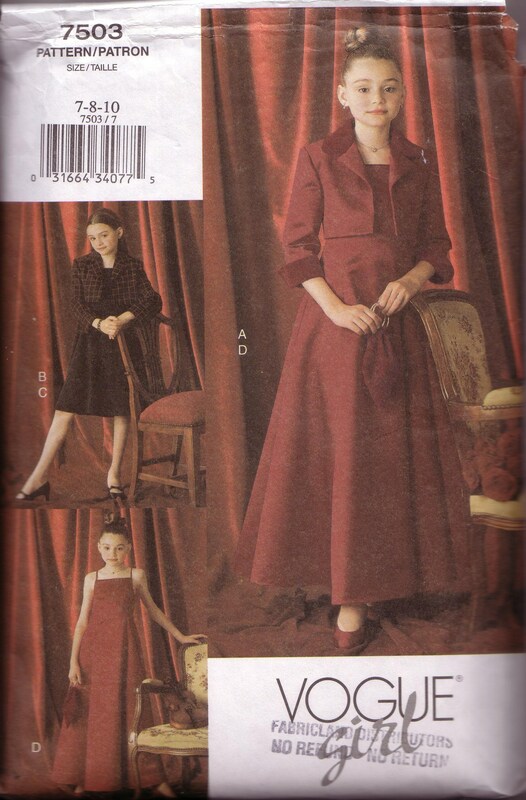 I wanted to make it out of silk taffeta or a tightly woven duppion, but couldn’t find the right colour of red for the right price in the right quality. And then one sunny day, browsing through my local thrift store, I stumbled across a custom made garment in the right red silk duppion. It seems to be a plus-sized garment, so there was no question that I would be able to cut the flared skirt for this dress. The garment was remarkably well made. Here’s a shot of the interior underlining. You can see a full shot of the original dress here. 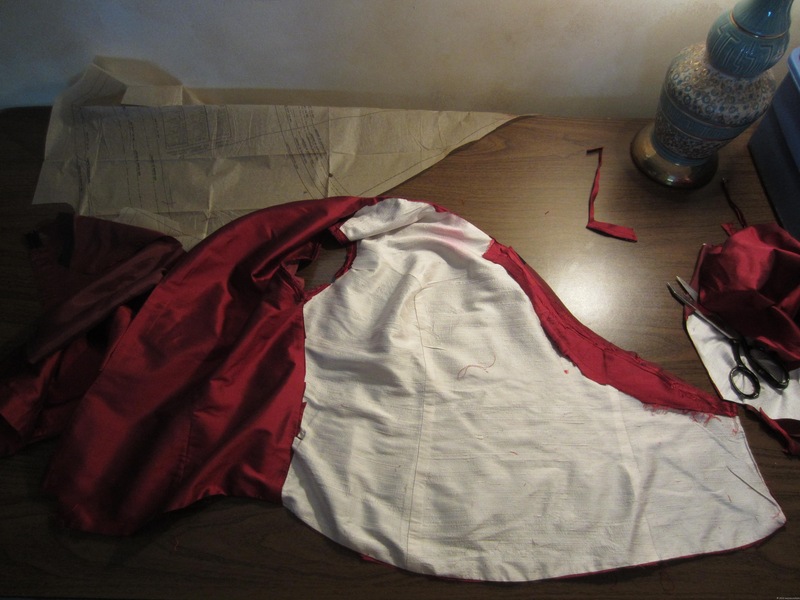 I salvaged every scrap of silk and the lining from the original garment. N2 wanted a halter style dress, so I thought I’d start with Vogue 7503, which is OOP and I’ve had in my stash for ages and never used. The front of the dress is Vogue 7503. The back of a smocked sundress is from Australian Smocking & Embroidery No. 75. I took the measurements of the back elasticized band of the sundress and the measurements of the skirt as my pattern. Once I had cut the rectangle of fabric for the back waistband, I thought I may as well use all the width and flare in the original skirt, and so stitched the back and side back pieces together and gathered them into the waistband. Then I turned down the facing, stitched three channels for the elastic and attached it to the side fronts. For the halter ties, I chose the tie pattern from another Australian Smocking & Embroidery No. 61 sundress called Frangipani. They’re about 2 inches wide at the top and are shaped like elongated leaves. You can see another picture of them here on a sundress I made for Niece #1. Here’s the rather plain, princess a-line front. And the more interesting back. As dear N2 wanted the skirt poufy and big and party-ish as well as mid-calf to ankle length, I thought I’d add some sparkle to an otherwise plain dress. I attached about 12 inched of red sparkle tulle to the bottom 8 inches of the lining. It looks uneven in the photo above, but that’s due to it’s not hanging straight on the hanger. If I manage to get any good pictures at the party this weekend, I’ll post them for you to see. Oh, and as a lark… yeeeeeeears ago… a good friend suggested it was rather not in the best interest of my abilities (!?) to send all my smocking, embroidery and little dress coats out into the world without any credit, so he designed a label for the garments I make for children. Three buttons for my three girls. Cute, eh? Well, this dress is a good example of how I mix and match patterns to get what I’m wanting. Do you do this pattern slash, burn and mix & match thingy, too? You are such a good mom! Love your dresses and the darling tag created by your friend. What fun you are having! Your work is so creative! No I do not mix and match patterns-I am a newbie to thinking like that but it is exactly my goal this coming year. Wow- amazing save and how cute is that! She has got to love it! When my daughter was little, I enjoyed going to the thrift stores and finding rare or different materials to make dresses for her. I thought I was the only one who did things like that 🙂 This dress you have made also reminds me of Vogue 1102. It’s just a pretty dress in the front with a “surprise” in the back. I absolutely love both your creation and the Vogue pattern.